Two pictures of the same woman: the first one being a portrait of her on hew own, and the second one showing her with (most likely) her husband. I find the poses on the second picture quite unusual for this type of photographs from this era, or at least I don’t remember seeing other photographs quite like this. 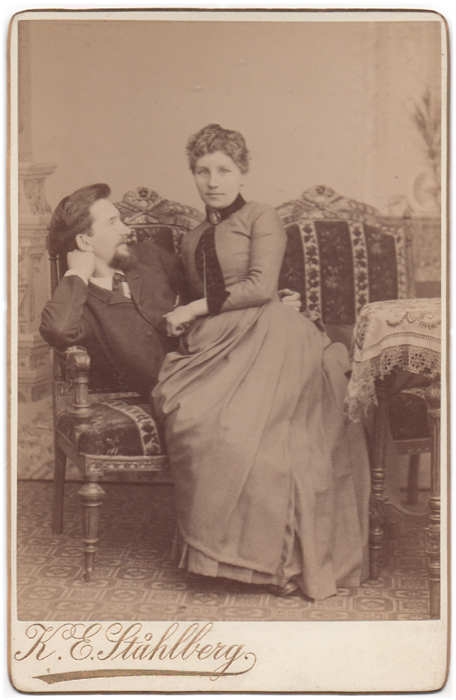 The couples on the other photographs I’ve seen or that I have in my collection are usually posed very formally: one of them sitting on a chair, the other one standing, and the only touch between them being one hand on the other person’s shoulder at most. Here, however, the mood is very different. Both are seated on a sofa, where the gentleman is lounging, holding his arm relaxedly around her waist, his eyes fixed on her an not the camera. The woman, although not appearing quite as informal, can still be noticed leaning toward the man. She is holding her hands together, the left one on top, showing the engagement/wedding ring on her finger. The ring is also visible on her portrait, where her pose is more formal and very typical for portraits from this era. 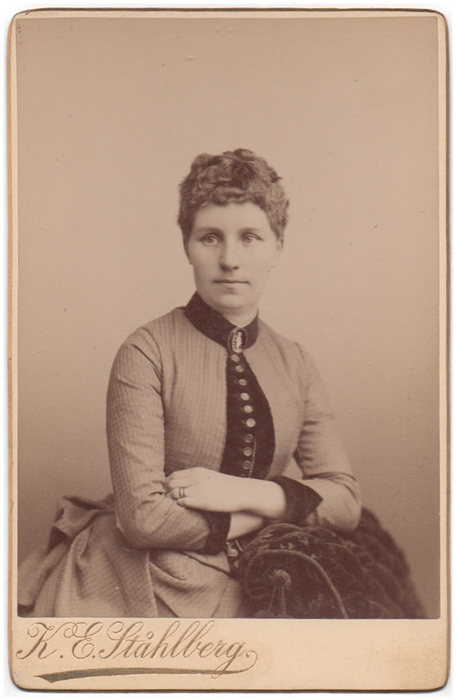 Both pictures were taken in Helsinki, Finland, in the photography studio of K.E Ståhlberg at some point during the 1880’s.